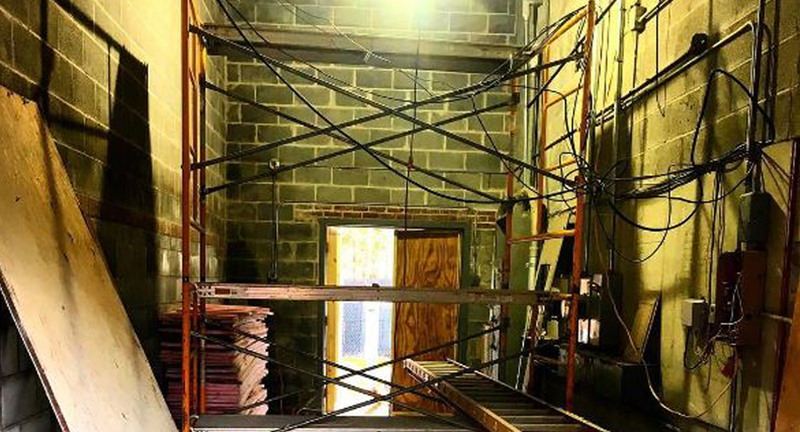 Under construction in Woodstock: A&P Bar, from the original owners of Oriole9 and Yum Yum Noodle Bar. Photo courtesy of the restaurant. Six weeks in, 2017 is shaping up to be a banner year for growth throughout the Catskills’ food and drink industry. At least three experienced local restaurateurs have new projects under way. Prominent members of the New York City food scene are investing in new efforts here. Meanwhile, a handful of entrepreneurs are combining eateries with other enterprises in creative ways. These upcoming ventures follow on the heels of a flurry of new restaurants that opened their doors this winter, including: Prospect Restaurant and Bar at Scribner’s Catskill Lodge in Hunter; Belladiel, a cafe serving Mexican, Peruvian and Guatemalan food in the former Winchell’s Corner in Shokan; and Foxfire Mountain House’s restaurant and bar in Mt. Tremper. First up on this year’s grand openings calendar is Mama’s Boy Pizzeria in Tannersville, which opens for dinner tonight. Helmed by longtime Catskills restaurateur Michael Koegel, it joins sister restaurant Mama’s Boy Burgers just across Main Street. The popular burger joint took over the iconic Smiley’s Ice Cream building in the summer of 2015, a few months before Koegel shuttered his first cafe, Mama’s Boy Coffee in Phoenicia. Mama’s Boy Pizza, at 6062 Main St., Tannersville, “will do for the pizza pie what Mama’s Boy Burgers did for the hamburger,” Koegel tells Catskill Eats. He hired Shandaken Bake’s Craig Thompson to develop a crispy thin crust dough recipe. Toppings will incorporate local ingredients such as beef from JJF Farms, which also forms the burgers he serves across the street. Pizzas on the initial menu include a classic cheese pie, a smoked prosciutto and mozzarella, a margherita and a combination of artichoke hearts and bechamel sauce. Locally sourced libations anchor the beverage menu. Mama’s Boy Pizza is open Wednesday through Sunday (closed Monday and Tuesday, excepting this coming President’s Day holiday). Woodstock will see two new venues from experienced Catskills restaurant owners this year. First up: a new spot from the founders of Woodstock mainstays Oriole 9 and Yum Yum Noodle Bar. Pierre-Luc Moeys and Nicole Paturel have teamed up with a new partner to form Meadow Hospitality Group, which plans to develop several new projects over the next couple of years, Moeys tells Catskill Eats. First up is the A & P Bar, now under construction at 83 Mill Hill Road in the former home of an A & P supermarket. “We couldn’t pass up the space, because it’s such a great space,” Moeys said. Moeys and Paturel sold their interests in their previous businesses in 2015 to focus on Lekker 209, a cafe and catering company in Stone Ridge. The couple’s return to Woodstock will be cozy and “our nicest place yet,” Moeys said. The new bar is on track to open this spring; check out its Instagram feed for some sneak peeks. As more urban dwellers continue to discover (or rediscover) the Catskills, urban chefs and restaurateurs continue to set their sights on new businesses here as well. The tiny Sullivan County hamlet of Hurleyville is set to welcome a new project from a well-known Italian chef. Woodstock has drawn the eye of a popular “detox lifestyle guru.” On the Greene County mountaintop, a Brooklyn restaurateur has leased a classic old motel, restaurant and nightclub. Back in Woodstock, Doris Choi, a noted chef and cookbook author, plans a 130-seat “Nouveau American” restaurant, the Woodstock Times reported late last year. Proposed for the former Joyous Lake property at 42 Mill Hill Road, the as-yet-unnamed project is still under construction; an opening date has not been announced. And while it’s still in the early stages, plans are in place for Brooklyn restaurant and bar operator Chris Young to revamp the Slopes Nightclub and Motel, at 6002 Main St. in Tannersville, according to the property’s longtime owner, Tom Hangarter. Young, who co-owns popular neighborhood joints The Commodore, El Cortez and The Drift, signed a 10-year lease in October to take over the Slopes restaurant, bar, clubhouse and nine-unit motel, said Hangarter, who has owned the property for 32 years. “He just hasn’t figured out what he’s doing yet,” Hangarter said of Young. In the meantime, Slopes is still operating as a nightclub on Saturday nights. In the nearer term, two new cafes are scheduled to open next month with business models that combine food and drink with other interests. The Wise Owl, at 196 Main St., Saugerties, is the brainchild of partners Jen Powlison and Katie Fleissner. Combining elements of an eatery and a retail shop, it offers a multicultural menu of savory vegetarian, vegan and pescatarian dishes, fresh juices, coffee and teas. Sweets include an extensive line of pastries, chocolates and confections. Local artisanal crafts and an eclectic mix of modern and vintage goods are for sale. With art and crafts, a browsing library, and even a bit of on-site crafting, the proprietors “aim is to spark a bit of curiosity and creativity in everybody.” The Wise Owl opens March 3. Later in March, a combo of restaurant and art space is set to open in Catskill. Hilo Café, at 365 Main St., Catskill, will offer small plates such as soup, sandwiches and bowls under owners Liam Singer and Laura Davidson. Draft beers from Hudson Valley breweries will populate the tap, while the cocktail menu will focus on “a small selection of standards as well as more unusual amaros and digestifs,” Singer says. The coffee will come from Brooklyn’s Cafe Grumpy. The rear of the cafe is set up as dedicated gallery and performance space for local artists and musicians to promote their work. One early pre-opening event, for example, featured visual artist Maximilian Goldfarb’s book Remote Viewing: Five Hundred Tableaux. Finally, one last note about The Egg’s Nest in High Falls, a restaurant that isn’t new but whose reopening is the most hotly anticipated since Sweet Sue’s in Phoenicia was reborn last year. After more than four decades, founder Richard Murphy shuttered the eclectic, beloved eatery last summer. Enter Cristina and Eric Silver, a young couple who moved from California to realize their life’s dream of running a restaurant. The new owners promise a modernized but still funky New American eatery; it’s set to reopen this spring. The Egg’s Nest in High Falls is under new ownership and expected to reopen this spring. Photo courtesy of the restaurant. And at Maria”s in Woodstock, a wood fired Pizza oven is under construction!